Hello all! So for the last couple of National Barbie Doll Collector Conventions I have been asked to do presentations on Doll Photography and blogging. If anyone is interested in hearing these presentations and learning what I talked about, I will be attempting to rebroadcast them in parts every Friday over the next couple of months. And the introduction to the series video. Just click to play. This entry was posted on February 16, 2018 by raberry65. 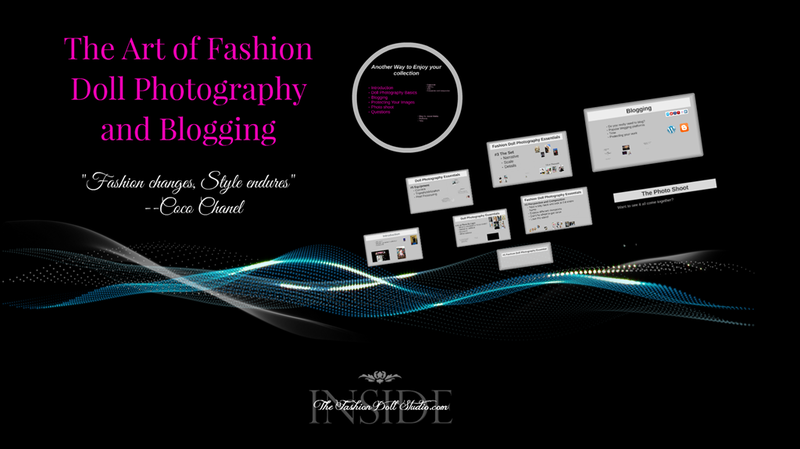 It was filed under Doll Photography and Blogging Presentation and was tagged with Doll Photography, Fashion doll photography, Inside the fashion doll studio, ITFDS, Rebecca Berry Photography, The Art of Fashion Doll Photography and Blogging. Thank you so much for this, I’m really looking forward to it! I’m glad! Hopefully you will find some useful information in this. Feel free to ask questions before hand or after. I’m very interested in hearing your presentations! I’m also still struggling with jealousy over your Elyses (Elysei?)! LOL! Well..hopefully the jealousy won’t prevent you from enjoying the presentations. Very interested, your photography is lovely. Thank you so much Johnny! I’m so excited! Just the other day I was looking at your photo shoot and trying to figure out how you light your scenes. I almost bought a set of 2 lights on stands from Amazon, they came with 4 bulbs in each light along with diffusers. Now I will wait and see what you suggest. Particularly how many bulbs to use in each stand, and what type of bulbs are best. Can’t wait! Thanks Rebecca – I’m really looking forward to this! This is soooooo exciting!!! Thank you for doing this! I missed that convention so I am glad that I can still see the information that you shared!! Aww! Thank you Lisa. Hope you find the rebroadcast segments useful. Enjoy you photos so very much and look forward to gaining from you wisdom. I love photographing my dolls and use photos on my phone. I could really use some tips on improving capturing those images. Thank you for your contribution to the doll community. Thank you so much Mary. I am glad you enjoy my imagers and hope you can walk away from these rebroadcast segments with some useful information. Feel free to ask questions after the segments. I will try to be good about answering them all on the blog. Will the presentations be live, and if so, what time will it start? Or, will I be able to tune in at my convenience? Great question Vernola! Actually the segments won’t be live…just taped segments so you can watch at your convenience. If you have questions after the segment, feel free to put them in the comments section and I will try to be timely in responding. Also..if I have a bunch of questions, I will just do another segment to answer them as best as I can.